BrianCrower.com | RunBC.com // JE Pistons - Less Friction, More HP! Asymmetrical, by definition, means "not symmetrical". The new asymmetrical forged pistons from JE utilize two different sized piston skirts, so are identified as an "asymmetrical" piston design. Why are asymmetrical pistons better? FACT: The two skirts of a piston do not experience the same amount of mechanical loading. During the firing cycle, the load exerted on one piston skirt, referred to as the "major thrust side," can be up to 10 times higher than the load experienced by the opposing skirt, referred to as the "minor thrust side." The disparity in skirt loading can vary in magnitude depending on key variables including the engine's stroke, rod length, and peak cylinder pressure. JE's asymmetrical pistons are the only pistons designed to specifically handle the dissimilar mechanical loads experienced by both piston skirts. The resulting piston design, features a large skirt area on the heavily loaded "major thrust side" and a small skirt area on the less loaded "minor thrust side". Overall, the piston design is stronger, yet lighter than previous designs. Why haven't I seen an asymmetrical design before? Today, asymmetrical piston designs can be found in many professional level racing engines competing in Formula 1, ALMS, NASCAR and more. Most of these engine programs are kept secret and not revealed to the public. Many automobile manufacturers have taken notice to the success of asymmetrical designs and recently began integrating asymmetrical piston designs in their own production engines. JE Pistons, who currently supplies several professional teams with asymmetrical pistons, identified the need to bring the "professional level" features to the rest of the performance marketing and began designing the first aftermarket asymmetrical forging in 2010. Will they clear my oil squirters? Yes. In fact, JE's engineering department created a computerized 3D model of all factory oil squirters during the design of the asymmetrical pistons to ensure proper clearance. Furthermore, the design of the forging allows for the oil to spray in the correct position to keep the pistons cool. Be cautious with other piston designs that require the oil squirters to be removed or block the oil from spraying in the manufacturers intended location. What about piston balance? Do the different skirt sizes cause the weight to vary side to side? All JE asymmetrical pistons utilize an offset wrist pin toward the major thrust side. By moving the pin toward the larger skirt, the balance of the piston on the wrist pin axis is nearly perfect. The offset, balanced piston reduces noise, increases piston stability, and helps ring seal. How much development and testing was performed on this new design? The asymmetrical design was the result of hundreds of hours of design, analysis, and validation. 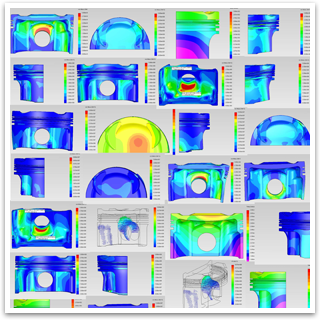 JE Pistons' engineering team started the design process by developing an initial asymmetrical design structure in SolidWorks. This initial structure was then refined and perfected through several iterations of finite element analysis consisting of multiple thermal and mechanical load cases. After completing extensive design and analysis, JE Pistons then manufactured prototype pistons from billet aluminum for validation testing in several high horsepower, turbocharged engines. The end result of JE Pistons thorough development and testing process yields the robust, yet lightweight asymmetrical design before you today. To date, the asymmetrical design has been successfully run in applications ranging from daily driven 250 HP turbo four cylinder engines to 2000 HP+ drag cars. Are there any other new features on the asymmetrical pistons? 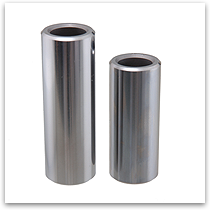 Contoured crown thickness: Just like each piston skirt, the piston crown is exposed to different mechanical and thermal loads in each area. The highest level of thermal (heat) and mechanical (pressure) stress is concentrated near the center of the piston crown. 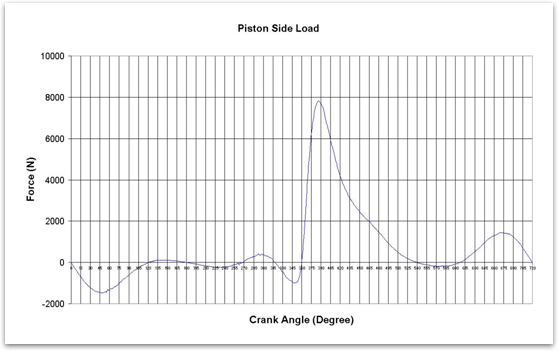 JE found the best way to handle these loads is to create a piston crown that is contoured according to these stress levels. In the location where stress is high (the center) the crown is thicker; in low stress areas the crown is much thinner. 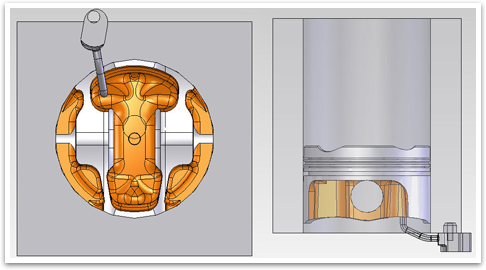 This design approach is one reason that JE's asymmetrical pistons are both strong and lightweight. Shorter wrist pin: All JE asymmetrical pistons are designed to use a 2.250" long wrist pin while most other designs require a 2.500" long pin. Since wrist pins are made of steel, a small reduction can make a large difference in overall weight. In most cases, the shorter wrist pin reduces weight by around 10 grams per cylinder! 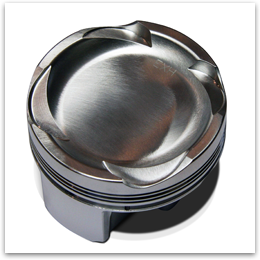 Smooth Finish Crown: Based on feedback from numerous engine builders, JE has added the "Smooth Finish Crown" to all off-the-shelf asymmetrical pistons. This unique process blends all edges on the piston crown and valve reliefs, reducing the likelihood of hot spots and pre-ignition.